Okay guys we all know that you will probably only use this once in your lifetime; probably on at Saturday morning at 7:30 with your wife in her yoga class. But you’ll be glad you had this instead of the floor. But ladies this product is great because I wouldn’t think any of you would want a pulled or torn muscle. This product can help with preventing that, because if you have an illness called “scared of being on the ground and getting dirty” this product is great for you. It keeps you off the ground and clean with nice stretched muscles. This mat comes in many assorted colors of your preference. This item is great for business events, tradeshows, and event handouts. It is also a good gift for your family members and lovers. 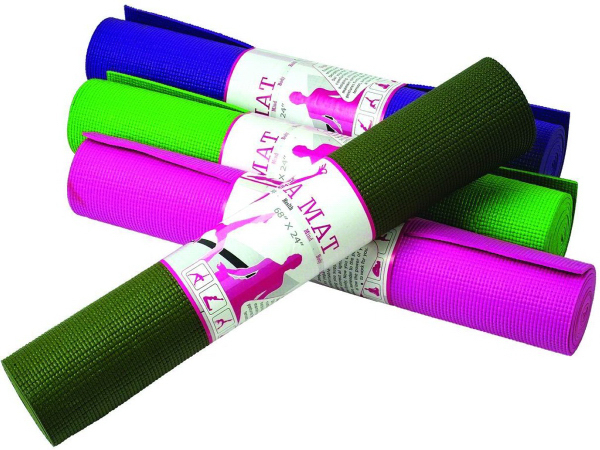 A Yoga Mat to keep you off of the ground and perfectly stretched.